By invitation of the School of Management and Logistic Sciences’ Dean Prof. Dr. Malek Alsharairi, the Dual Studies Advisor Dr. Stefan Braun - who has an international 20 years’ experience in running trainings in this field - conducted a 2-days workshop on Professional University Teaching on 28th of March and 4th of April at the Consultation and Training Center CTC. 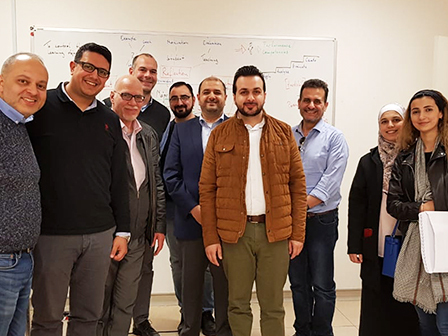 The participants discussed how to integrate aspects of the psychology of learning, the motivation of students as well as the inductive and practice-orientated way of teaching and activating methods in their lecturers. This group of innovative university professors will continue to widen their own teaching skills to provide excellent education to GJU students. More courses on innovative teaching and learning are foreseen in the future.